Made this for my neighbor to give to her fiancée for his birthday. He loves it! She wants to buy more. Made my own pattern for the horns. Added letters to the front. did you make the letters? Yes. I crocheted the letters then sewed them on. Not a fan of crocheting letters or more so, not a fan of sewing. I prefer to stitch them. and I’m not a fan of sewing either! I love this! 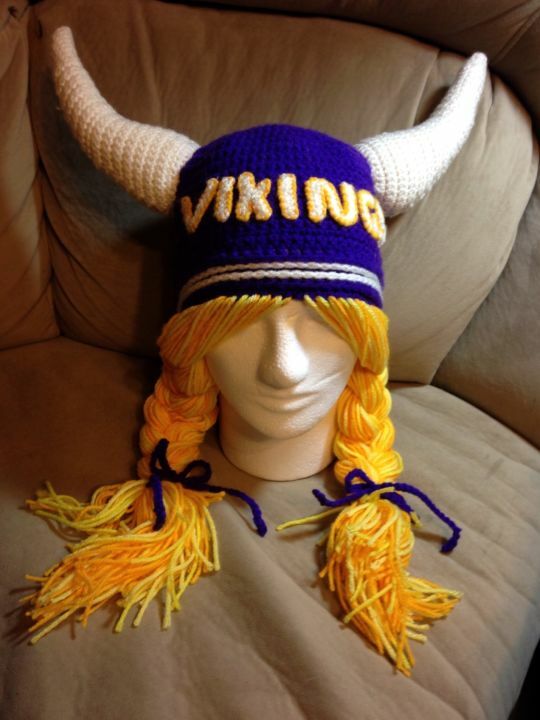 Know a few Vikings fans and may have to try making it. Do you have a place to find patterns for letters? Ravelery has a good free alphabet pattern that I used. Sorry, Ravelry. It’s under Letters A-Z by Handy Kitty. Perfect size! Thank you so much! I have a few people who are Viking fans and would love to try and make one similiar to this! I am new to this site/group so I was wondering if you have a pattern somewhere for the hat? If not, I am sure that I can figure it out. I just used a standard beanie pattern with HDC. I wouldn’t suggest double crochet with having the horns on it.